That being the case, how does the syntax work here? Specifically, the two issues I have are (1) with the text as it is preserved, that the article is not repeated, and (2) with the restoration, that ἀφαιρεῖν is constructed with accusative and genitive, rather than accusative and dative. 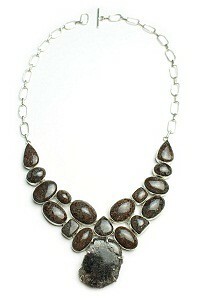 The image of the black jasper necklace is in the public domain. 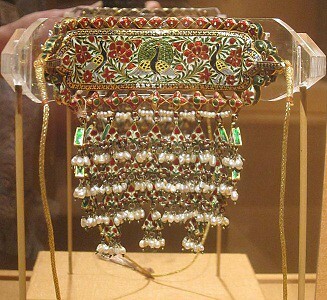 The image of the 19th century Arya necklace from India is owned by Hiart and has been released into the public domain. 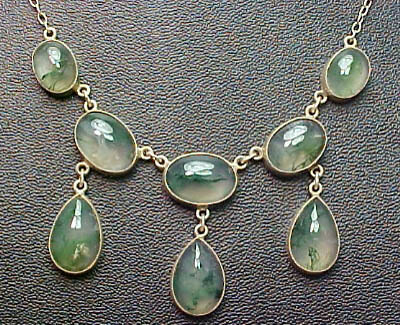 The image of the moss agate Edwardian necklace is held by Nora and has been released for use under a CC BY 2.0 license. ἀφαιρ-έω, Ion. ἀπαιρέω, fut. -ήσω: pf. ἀφῄρηκα, Ion. ἀπαραίρηκα: aor. ἀφεῖλον, later inf. ἀφέλαι GDI4940.35 (Cret. ); ἀφῄρησα Gal.11.121:—take away from:—Constr. : mostly ἀ. τί τινι, σῖτον μέν σφιν ἀφεῖλε took it from him, Od.14.455, cf. A.Eu.360 codd., etc. (but also, relieve one of a duty, X.Cyr.7.1.44): less freq. ἀ. τί τινος Ar.Pax 560, X.Lac.4.7; κῆρα χώρας A.Th.777 (lyr. ); ἔκ τινος Id.Eu.444; also τινά τι prob. l. ib.360, S.Ph.933, v. infr. II. I, III: c. gen., take from, τιμῆς οὔτ' ἀφελὼν οὔτ' ἐπορεξάμενος Sol.5.2; μηδὲν ἀφαιρῶμεν τοῦ ἀδίκου (from the unjust man) ἀπὸ τῆς ἀδικίας Pl.R.360e; τοῦ πλήθους diminish the number, X.Vect.4.4: c. acc. only, ἀπελὼν τὰ ἄχθεα having taken them off, Hdt.1.80; βασιλέων . . ὀργὰς ἀφῄρουν took away, E.Med.455, cf.Ar.Pl.22,Ra.518. I don't see the lack of the article as a problem at all. Couldn't καθορμίων λιθίνων just mean something like "necklace stones," i.e., the jewels which make up the necklace without it necessarily being something elaborate? Just a suggestion, not really sure. Barry Hofstetter wrote: Couldn't καθορμίων just mean something like "necklace stones," i.e., the jewels which make up the necklace without it necessarily being something elaborate? Just a suggestion, not really sure. Taking the iota as an adjective, it could, but then, we'd expect it to be followed by a noun like; τό ... περιτραχηλίδιον (κατειργασμένον) ἐκ καθορμίων λίθων. As a diminutive, a noun, it could be followed by an adjective λιθίνων. λίθινος describes the material from which the καθόρμια are made. The story is that the one bringing the complaint to the king was taking a bath when the woman walked in, slapped here anywhere without regard for decorum, and then took her necklace. My thinking was dative of (dis)advantage, which might not mean from off er person. Actually, I think the fineness of distinction is beyond my level of Greek, so it's a good time to ask. While I understand it generally, the other difficulty I have in understanding clearly is in these two phrases. Did the woman who entered the room try to talk her out of the bath-tub, did she enter the tub and try to push the writer of this petition out? I'm assuming that it is not talking about dragging. Also, is the the ἐμοῦ ... οὐκ ἐκχωρούσης referring to not giving into the demands of the other, or to not vacating the tub. Of course, essentially, in either case the result is the same in the end, but I'd like to know which one is expressed in the Greek? After all, we are working towards understanding the Greek, rather than just getting a passable translation. Well, if I write "My wife came in and kicked me out of the bathroom..." What type of action does that actually describe? While ἐκβάλλω does not have the slightly metaphorical force of "kick" in the English context, it could cover any one of several type of actions the result of which would be a move from one place to another motivated by an external force or action. I think you are trying to overread this -- the precise picture of the action is not the point. And in light of ἐμοῦ δὲ οὐκ ἐκχωρούσης does this mean ἐκβάλλει should be conative?